I was in Tel Aviv, Israel in a color symposium meeting when I saw in the heavenly realm this image now on canvas called His Final Roar. Later I found out that my brother in the Lord also saw this vision at the same time. Translating it from the amazing radiance of light/color into acrylic paint was quite a struggle on many levels. Fairly obviously the Lion of Judah being of white hair is from His portrait description in the book of Revelation. 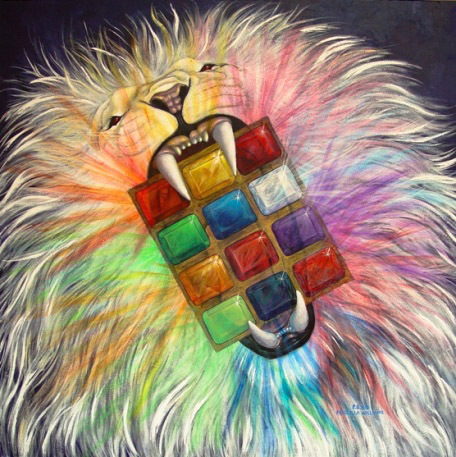 The Lion of Judah is our covenant keeping God. He has shown Himself faithful to the 12 tribes of Israel (represented by the 12 stones in the priestly breastplate which He holds firmly in His mouth…His very breath raises dry bones). On that day as the 12 tribes are gathered in and they say, “Blessed is He who comes in the name of the Lord” His final roar will cause all the beauty intended for Israel to shine over all the earth, becoming a life-giving blessing to all nations, all of creation. Zeph. 3:20: At that time I will gather you; at that time I will bring you home. Micah 2: 12,13: I will surely gather all of you, O Jacob; I will surely bring together the remnant of Israel. I will bring them together like sheep in a pen, like a flock in its pasture; the place will throng with people. One who breaks open the way will go up before them; they will break through the gate and go out. Their king will pass through before them, the Lord at their head. Rev. 1: 7,8: Look, he is coming with the clouds, and EVERY EYE will see him, even those who pierced him; and all the peoples of the earth will mourn because of him. Matt. 23: 37-39: O Jerusalem, O Jerusalem, you who kill the prophets and stone those sent to you, how often I have longed to gather your children together, as a hen gathers her chicks under her wings, but you were not willing. Look, your house is left to you desolate. For I tell you, YOU WILL NOT SEE ME AGAIN UNTIL YOU SAY, ‘BLESSED IS HE WHO COMES IN THE NAME OF THE LORD’. We watch God’s work with His people, the Jews, to know how close we are to Yeshua’s return. Some viewers have identified the teeth of this lion as the horns on the altar. Refugees ran to the horns on the altar for safety and protection. Here the 12 tribes find themselves in the ‘horn of salvation’ and on the altar as the mighty One roars through them. Each casts a different color and sound of the roar sounding much like a symphony. Each color speaks of a distinct attribute or facet of His nature. ALL THAT EVER EXISTED WILL KNOW HIS FINAL ROAR! GET READY!